It wasn't an April Fool's prank when news leaked that the restaurant Hurley's would shutter after 16 successful years in business. Well-known as one of the top restaurants in the heart of Napa Valley's multi-Michelin-starred city of Yountville, the top-tier ranking was no small achievement in a destination dotted with greats: the French Laundry, Bouchon, Ad Hoc, Bistro Jeanty, Bottega, and the latest opening of the crystal-covered palatial-designed RH, aka Restoration Hardware. Eyebrows were raised at the subsequent announcement of a Mexican restaurant opening in Hurley's former space, and by the fact that it would be operated by celebrity chef Thomas Keller. Keller already operates three restaurants and a bakery within the 1.5 mile radius of Yountville. With the opening of Keller's fourth restaurant, La Calenda, the allure of this culinary utopia escalates yet another notch. In a winter drizzle, I took my place under a portico crammed with a hopeful group whose goal was to score the first seating once doors opened at 5pm. Arrive later and you'll leave your name with the hostess and return in a while, instead of waiting outside. If diners opt to wait, there are tables inside at the bar or outside on a covered patio, where drinks aplenty are served. Atypical of Keller's French cooking, La Calenda is a Oaxaca-inspired restaurant with a reasonably priced menu and a no-reservation system. It also has a sports bar with a playlist of club music (not this grownup's fave), the better to attract millennials. The restaurant's interior showcases carved Oaxaca wood chairs, artwork and ceramic tableware to complement its all-Oaxacan menu. The paper menu lists eight antojitos (appetizers) that include quesadillas al pastor with pineapple and Chihuahua cheese, and shrimp cocktail. 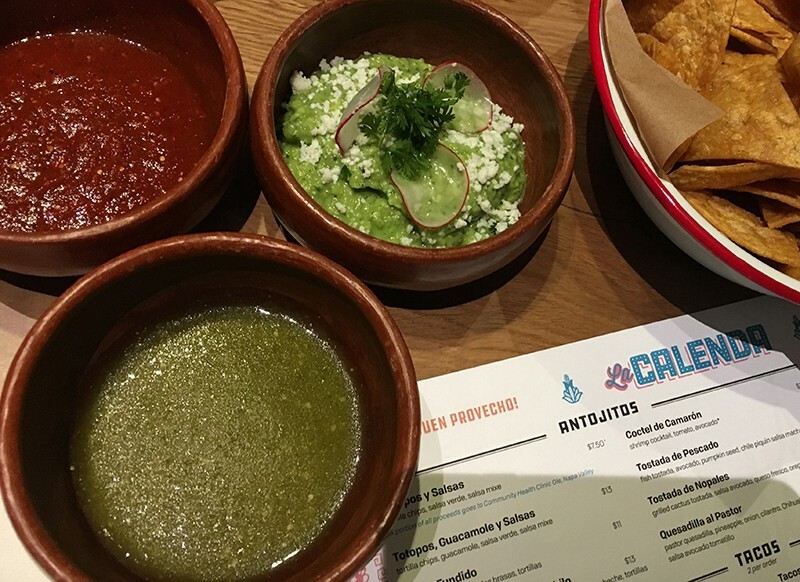 There's also that Mexican staple, a bowl of addictive house-made tortilla chips, spicy guacamole, a ceramic bowl of salsa verde and another of salsa mixe ($13). My dining companion sipped on a specialty margarita while I sipped on a non-alcoholic version (in order to adhere to my self-imposed "dry" January detox program). We took our time with the menu and decided to share several small plates, beginning with the charred butternut squash tamale ($6), cooked in an avocado leaf and served with spicy black bean salsa. Our server entered our order on a handheld POS device. My favorite dish was a duo of lightly fried red snapper tacos ($13) with chipotle mayonnaise and cabbage. I'd order this again on my next visit and skip the overly spicy enchiladas verde ($14) with Swiss chard. True to form, Keller reconstructs the enchilada with a green pepper sauce over a thin, blue-corn tortilla wrap with Swiss chard inside. Dessert is a must, so be sure to save room. The French Laundry's pastry chef makes the desserts for La Calenda, and priced at $9 each, you're getting a bargain. The silkiness of the flan put all previous versions to shame, and an order of petite churros transformed this fairground treat into an elegant wand to swipe a dollop of perfect consistency that attends the dulce de leche.